Subject: Flaming Zombie dashboard missing? Shambling Zombies become Flaming Zombies when they may contact with fire, yet I cannot find the Flaming Zombie dashboard anywhere. Am I being more blind than usual? This board is in the Core Game Box. If it is missing contact CMON. Are you sure it's not on the reverse side of one of the others. 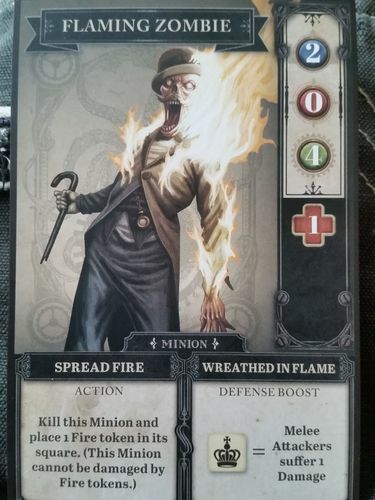 Flaming zombies is a single sided card/dashboard found at the bottom/back of the monster/agent dashboard stack when you open the game. It will be on the back of something else. Turn them over and check again. It seems there was a slight adjustment from the version showing in the KS campaign. No. It is by itself. Dimhalo is correct. So if the OP cannot find the card in the core game box, he needs to contact CMON.